Collections of the Sector of Herpetology include approximately 15,000 storage units. The major part of these collections includes “wet” specimens of amphibians and reptiles of the fauna of former USSR, as well as materials from some other countries. Osteological collection consists of 618 storage units and more than 1,500 specimens of 33 amphibians species and of 198 reptile species. Recently, collection of preparations for genetic studies (in particular, mitochondrial DNA analysis) was initiated, it comprises now about 50 storage units on over 80 specimens. There is the type collection with 139 specimens of 36 taxa. There was no permanent registration system of herpetological collections during the first third of 20th century. The first registration books began in 1930 by Shibanov for amphibians and reptiles separately, with the respective collection numbers being assigned the first letter A for the former and O for the latter (subsequently changed for R). Systematic catalogue began in 1970s-1980s. The so called Shibanov's collection is registered with reservation of previous collection numbers. 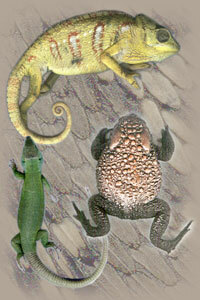 Contact persons are: V. Orlova for reptiles, E. Dunaev for amphibians.